Water based face paint- Apply with a damped sponge or brush. We recommend for you to apply water to your brush or sponge and then load the makeup rather than spraying your paints. This line of makeup requires a bit more water than other brands. The first time you use a color you might need to work the color until you break the "waxy" barrier. All pearl colors are really nice for blending and have a nice shimmer that will add magic to your designs. Metallic colors are really nice for laying a solid base and for line work. These colors are suyper metallic looking and provide solid coverage. 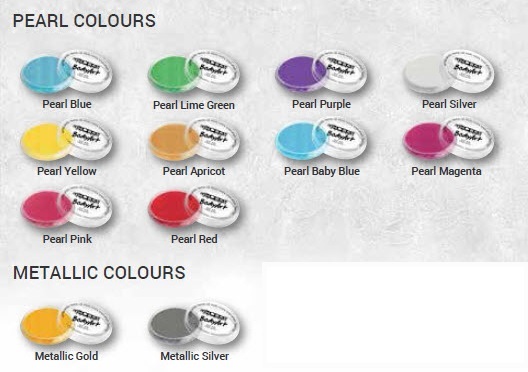 All pearl and metallic colors are made with FDA compliant ingredients and are hypoallergenic. These paints contain no perfume to reduce the risk of allergic reaactions.